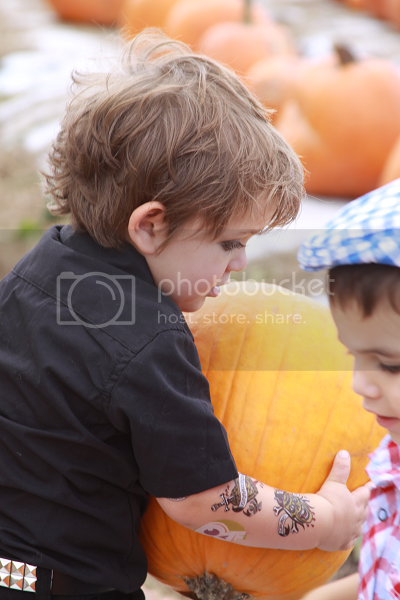 This is Ethan's third Halloween and I've been totally excited for the festivities to begin. I put way too much thought into Ethan's costumes but I can't help it -- it's fun, and I'm enjoying it while I can because I've accepted the fact this will probably be my last Halloween choosing his costume for him. Today was our family trip to the pumpkin patch so we decided it would be the perfect opportunity to deck Ethan out in his costume for the first time for the upcoming Halloween festivities. I tried my hardest to keep this year's costume a secret though I admittedly spilled the beans here and there when I just couldn't keep the excitement in any longer but after today's Instagram reveal it's finally out in the open. 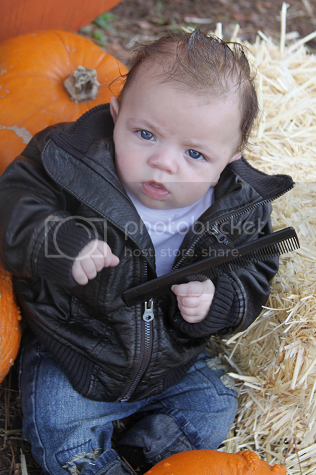 Ethan's first Halloween, he was The Fonz. I came up with this idea during a late night feeding where I sat half-dazed watching Happy Days reruns and it just clicked. 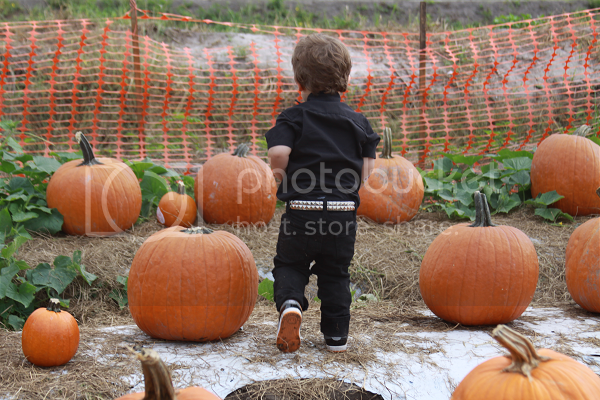 He sported his little leather jacket and greased back (with organic baby oil!) hair like a champ and even toted around a little comb for a while. Last year was Ethan's famous Risky Business costume. I was really excited when this idea popped in my head but my husband was totally skeptical that anyone would get it. I guess he underestimated Risky Business because Ethan won first place in a costume contest with this one and the best part was that it was probably the easiest costume ever -- a pair of glasses, a white button-down from Old Navy and some white tube socks. 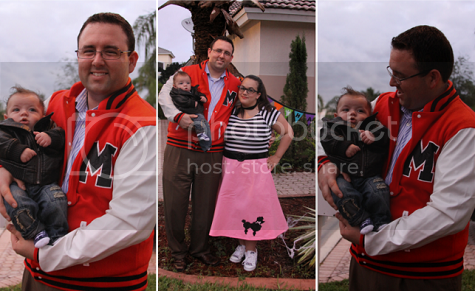 Still, this costume was a huge hit and Ethan was even featured on our local news channel for it. Even I felt a little intimidated to try to top this one but a few months ago the greatest idea popped into our heads. I mean, we think it's the greatest idea ever. 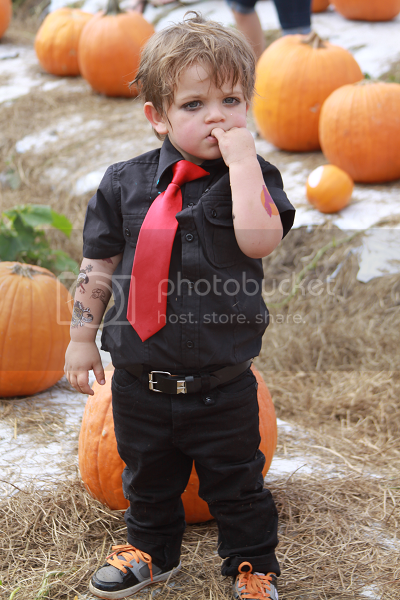 This year we went with Billie Joe Armstrong from Green Day, specifically a la the American Idiot music video. 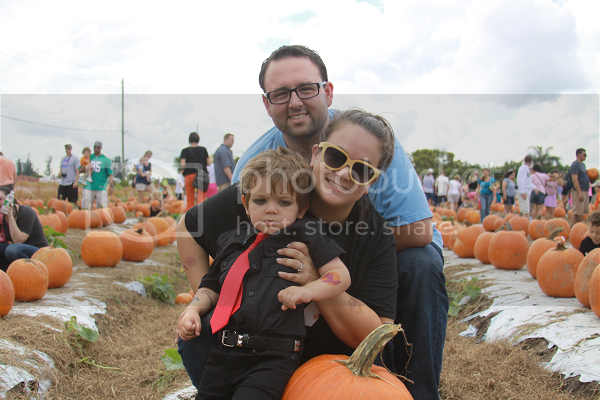 I think my husband and I laughed the entire time we got Ethan dressed up for the pumpkin patch today. He looked adorable. 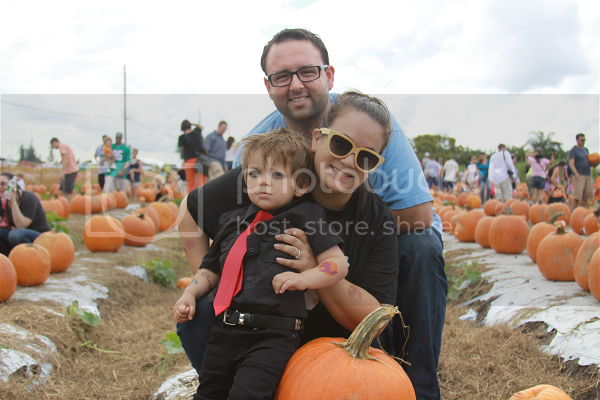 It was still about five hundred degrees here in South Florida so our time at the pumpkin patch was cut a little short. A little boy had even fainted in the parking lot once we were pulling up, which was kind of a horrible start. 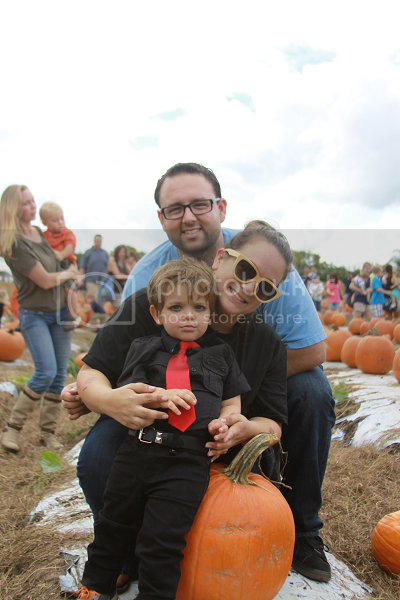 Between the heat and the crowds, we did our family photos, let Ethan play among the pumpkins and then retreat back to the car where we reveled in the A/C and drove straight to the grocery store to pick up a pumpkin without falling victim to heat stroke. I felt like a little bit of a cheat, but Ethan didn't mind. 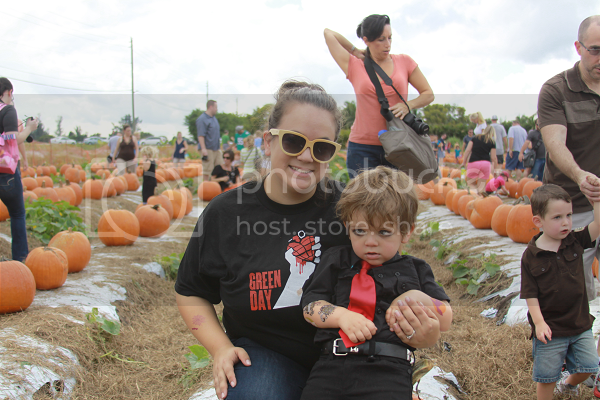 As long as he got to ride in a cart next to "the big pumpkin," he was totally cool like the rockstar he is. SO cute and such great ideas! 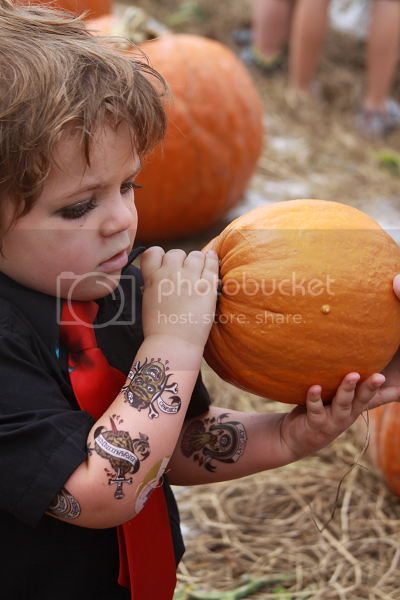 We're still racking our brains to decide what Crew should be for his first Halloween. Maybe it'll come to me during a late night feeding, like it did you! 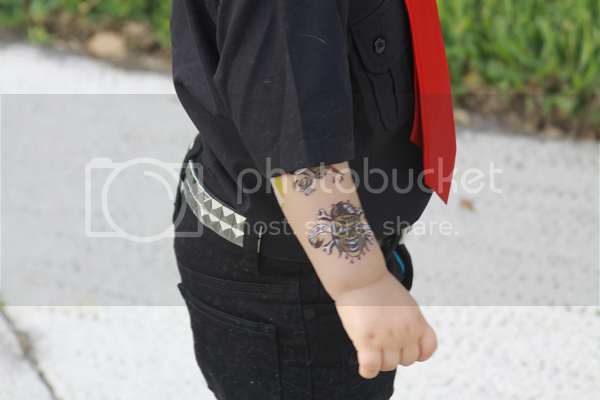 Your little boy is probably the most adorable thing on this planet!! I'm sure the right idea will come to you soon! 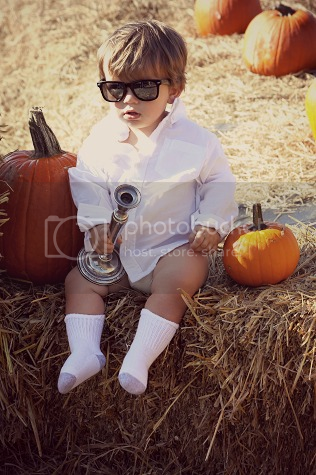 I cannot wait to see what Crew is for his first Halloween! He is so cute! Haha, thank you! I have a feeling this was my last year without him having an opinion. Hopefully he always thinks my ideas are cool! Ahhh! 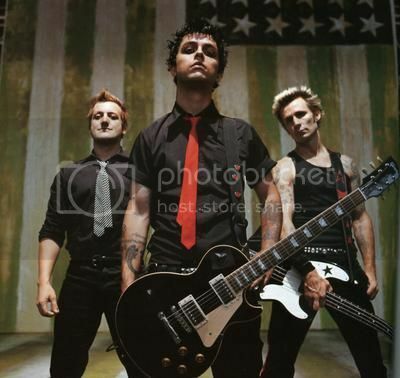 These costumes are AMAZING!!! I literally squealed out loud at each one!!! Sometimes the stars gotta play more minutes in the playoffs. Tonight, our bench did a great job. I played 31 minutes, DeMar played 33. No. It would have to be eroded into sediment (which means that rock has been broken down by wind and/or water and/or many dramatic temperature changes then spread all over an area. So technically, a sedimentary rock could be made of formerly igneous rock but it wouldn't be the same rock. It was local birdwatcher John Madeka who first noticed something wrong at George Lake in Hammond, Indiana. One person was killed in a single passenger ggg shirt plane crash at the Porter County Regional Airport. Thursday at the airportin Valparaiso. Instead, she ran a family. Her last contribution came as she lay dying. Most public family t shirts figures prefer to be seen as a disease, and to the death, not willing to shine a light on motorcycle t shirts the more passive palliative care.